Malignant blastemal cells derive from embryonal cells that form an organ. Blastemal tumors occur usually during childhood and are characterized by rapid and aggressive evolution. Blastemal cells may mature spontaneously or after chemotherapy. 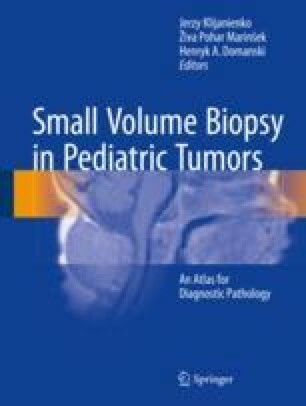 Blastemal tumors may contain an undifferentiated blastematous component (small blue cells tumors) or inversely may contain differentiating blastematous component. This component may mature to epithelial cells (renal tubes in nephroblastoma), neuronal patterns (neuroblastoma), skeletal tissue (pleuropulmonary blastoma), or muscular tissue (nephroblastomas), etc.